One of my new year’s thoughts was to use my collection of rubber stamps more in my art. For a while, I looked down on them as not-art, or even as too much like a coloring book. But I seem to have come full circle and am incorporating them into a lot of art lately. Then, I stumbled upon the Wednesday Stamper, a site that encourage artists to use rubber stamps and post their work. This weeks theme is time. 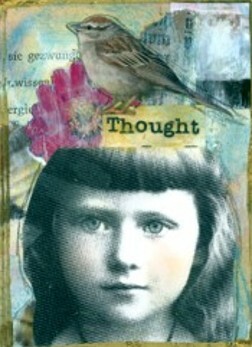 My piece is an ATC with a tiny picture of my Mother-in-law as a wee time traveler. I need to update my list of ATCs for the swap, and will do that tomorrow morning to include Time Traveler, the ATC below, and a few others I have made this week. One last thing (and it’s about yarn). I’ve been playing with mixtures of celadon and turquoise all week and was delighted to come up with this sweet little yarn. I know it isn’t modest to say this, but aren’t the colors beautiful? It just makes you want to go forth and knit something! ← What can I do with one little skein? I really like this piece, great picture of your mother in law. love your mil-time travelling on that fish. really nice card. 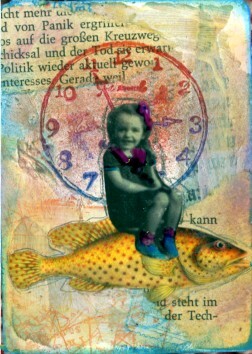 I love both your ATCs, Joyce; nice to see your work on the Wednesday Stampers site. Great atc’s Joyce, love mil’s mode of transport! How cute is this to use your Mom’s picture. Nice idea. Wonderful work!Love both, so beautiful! What a cute picture of your MIL…. would love to know what she thought of your artwork :0) Gorgeous colours.